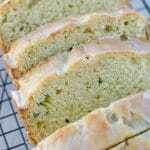 If you think you don’t like zucchini bread, you have to try this recipe! This is seriously the only sweet recipe you will ever see me make with zucchini and I’ve been making it for several years now. 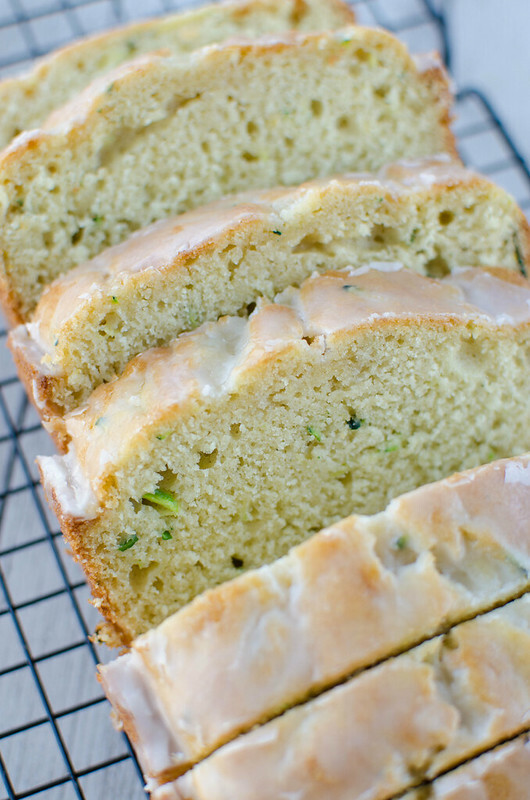 It’s buttery and moist and you won’t even taste the zucchini which is probably why I love it so much. It’s sweet enough to get rid of a sweet craving but not so sweet that you can’t have it for breakfast with a cup of coffee. What Else Can I Make with Meyer Lemons? Meyer Lemons are a cross between a lemon and a mandarin orange so they are less acidic and a little sweeter than the average lemon. They’re also a little darker in color, closer to orange than a yellow. Most importantly, they’re perfect in a variety of baked goods or savory dishes! If you want something sweet, try my Meyer Lemon Strawberry Shortcakes, this Meyer Lemon Pudding Cake, this Lazy Girl’s Meyer Lemon Meringue Tart, or a Meyer Lemon Upide Down Cornmeal Cake! My Meyer Lemon Brussels Sprouts Pizza and this Butter Lettuce Salad with Creamy Meyer Lemon Dressing are a couple savory ideas! If you are having trouble finding meyer lemons (or if they aren’t in season), you can definitely use regular lemons in this recipe and other recipes that call for meyer lemons. There really isn’t a huge difference in tartness or taste. This is a really simple quick bread recipe that will take you less than an hour from start to pulling it out of the oven. Just a basic buttermilk batter with meyer lemon zest and juice mixed in and shredded zucchini stirred in. Oh, and there’s a glaze! Just two ingredients and really makes the bread extra special. Preheat oven to 350F. Spray a 9x5" loaf pan with baking spray. In a mixing bowl, whisk together flour, baking powder, and salt until no lumps remain. Set aside. In the bowl of a stand mixer fitted with a paddle attachment, beat butter and sugar until light and fluffy. Beat in eggs, one at a time. Beat in the buttermilk and juice and zest of 1 meyer lemon. Add the dry ingredients to the wet and beat until just combined. Stir in zucchini. Pour batter into the prepared pan and bake for about 45 minutes or until a toothpick inserted into the center comes out clean. Cool in pan for about 10 minutes and then transfer to a wire rack to cool completely before glazing. To make the glaze, whisk together the powdered sugar and meyer lemon juice until no lumps remain. Drizzle over cooled bread. 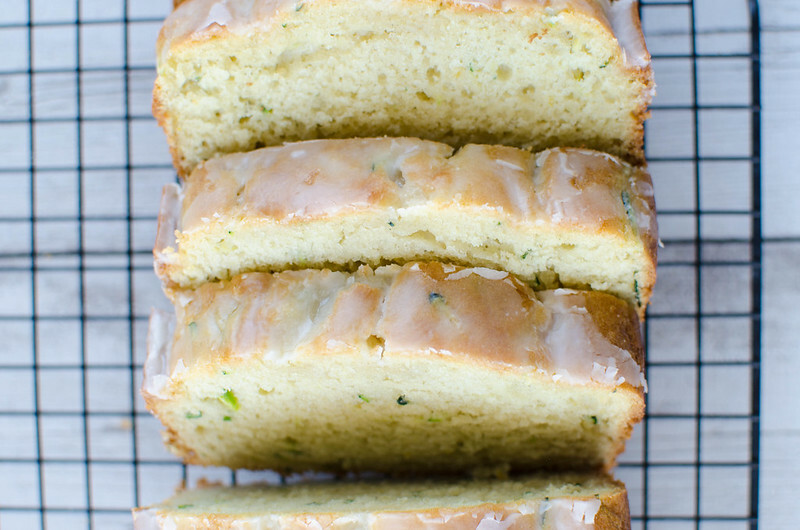 23 Responses to "Meyer Lemon Zucchini Bread"
Can you believe it? I haven’t seen meyer lemons either! These look fantastic however. I need to find some asap. We have Meyer lemons in our grocery store all year round in Canada. I didn’t realize there was a “season”! I use them in pesto…sooo good! What?! I’m really jealous! We seriously only get them for a week or two! I am blessed to have 2 meyer lemon trees in my yard, I live on the Texas Gulf Coast. They are ripe Oct-Jan and keep a couple months after that, then I freeze the juice. I make a semilar recipe will have to try yours. I’m so jealous! When we move somewhere with a little more water and a little less hard red dirt, I need to look into having a tree! My Mother-in-Law grows Meyer lemons in her backyard here in Southern California which officially makes me one of the luckiest ladies in the world, because she has too many of them for just her. I have to make this bread!!! I never seem to make it to the store in time to find these elusive lemons!!!! I need to go today and see if my stores are on top of things because I need this bread!!!! I’ll keep an eye out at the store for some because I’m probably the last person on the planet to have seen or tried meyer lemons. This bread is totally on my to do list! I’ve found them like 2x in New England. I almost jumped around in the store. I was so excited. ha! I have never actually tried meyer lemons, but I always hear about them. I will have to keep an eye out when I’m in the grocery store today. This bread look amazing, I can’t wait to try it! This looks really good! I hope I can find some Meyer lemons! 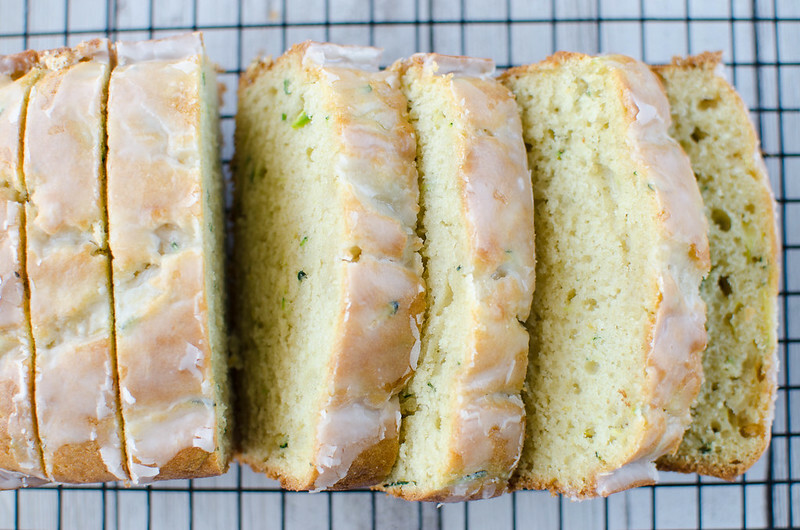 I also want to OD on Starbucks Lemon Bread…it’s so good! I saw some meyer lemons in Fresh Market a few weeks ago. But I live in FL so we usually have all fruit year round…except for peaches. WHY can’t I find any peaches right now. For some reason I have really wanted fresh peaches but cannot find any! I’m a total sucka for lemon treats/breads/food so I could totally eat the entire loaf of this! LOVE it, Amanda! I can’t wait to try this! I adore meyer lemons and I agree – the season is way too short!! Pinning this gorgeous bread! This past summer I bought an “Improved Meyer Lemon” shrub at a Pike’s Nursery in GA (bushy, like a shrub vs a tree). I kept it in a large pot on our deck. It had tiny white, fragrant flowers, then tiny little green buds followed which developed into fruit. It took the lemons all summer, fall and winter to grow and ripen. It was well worth the wait, as it was a pretty plant and as it turned out, I was the lucky recipient of 9 Meyer Lemons in December & January. Funny thing is that when I have been fortunate enough to find these lemons at a grocery store they have always been small (kind of like key limes) but the ones I grew were HUGE! Seriously, I’ve never seen such large lemons! After seeing how long it took them to fully ripen, I can appreciate what a precious commodity they seem to be! Now that we’ve picked the last of the lemons, I’ve moved the potted shrub into the Garage for the winter hoping it will survive the winter. Enjoyed your blog very much. Thanks for the recipe which I will definitely try. Deb (a retired warrant officer’s wife). Well now it makes sense why they’re only around for such a short time! They’ve already disappeared from my grocery store – crazy! I hope your plant survives winter. I’ve got to look into growing my own! I have a meyer lemon bush in our backyard. How awesome is my life? Ha. I used most of them for lemon curd and lemon bars, BUT I have a few left. I knew the minute I saw you post the batter on IG that I would be making this. That’s so weird because in NYC, Whole Foods seems to carry them year-round! They are pretty much my favorite lemons in the world. I’m sure this bread is amazing! 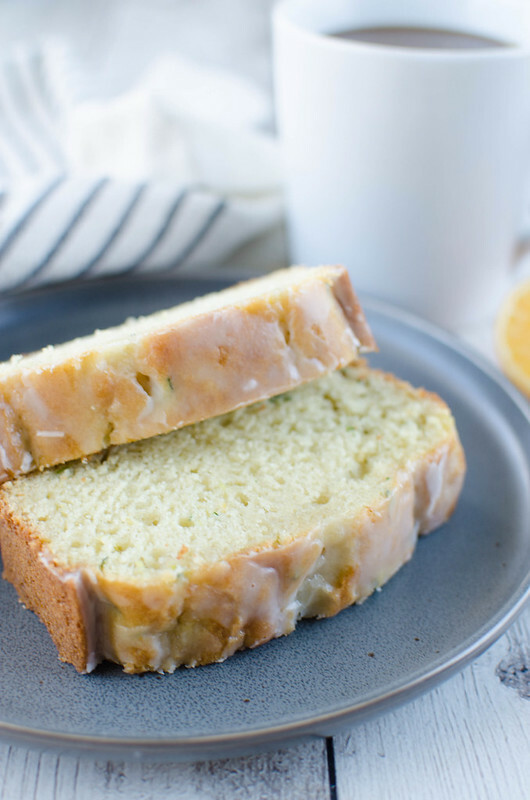 Considering I meyer-lemon EVERYTHING, I’m so pleased to see this recipe for a new combo in zucchini bread! YUM! Pinned! !